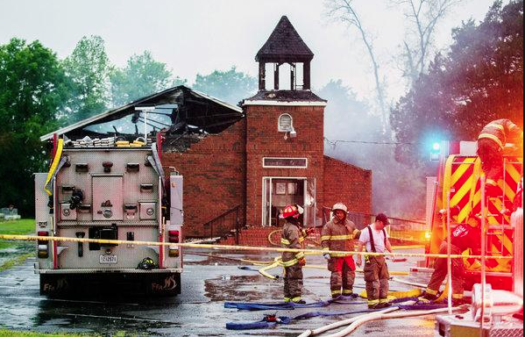 Three historical African-American churches have suspiciously caught on fire in Louisiana in the past several days. There are still many questions, but one lawmaker says that the method behind the fires is “notably the same”. The first fire happened last month at the St. Mary Baptist Church in Port Barre. The second fire took place on April second at the Greater Union Baptist Church in Opelousas. The latest fire happened just two days after the second fire at the Mount Pleasant Baptist Church in Opelousas. The churches were all empty at the time of the fires and there were no injuries. As of Wednesday multiple law enforcement sources state that “a person was in custody in relation to the fires”. “There is a certain commonality” said the Fire Marshall. “Whether or not that leads to a person or persons or groups, we just don’t know. And that’s not unusual for us not to know at this point”. The fires have left many people in the community asking who would target such institutions. “There could be many reasons why this happened-none of them are righteous” said the Fire Marshall. “If you participated in this, you have succumbed to evil”. The son of the Louisiana Sheriff’s deputy was arrested on Wednesday in connection to the church fires. Holden Matthews, 21, was arrested and has been booked in the St. Landry Parish jail on suspicion of arson.